Something that has been on my list for the longest time is a crockpot. I have been fantasizing about being able to come home, chop up a bunch of vegetables, throw them in a pot, and put the pot in the refrigerator. Then, before leaving for work the next morning, put it on low, leave for ten or twelve hours and come home to hot, stewey goodness. Anyway, S. and I finally picked one up this weekend. 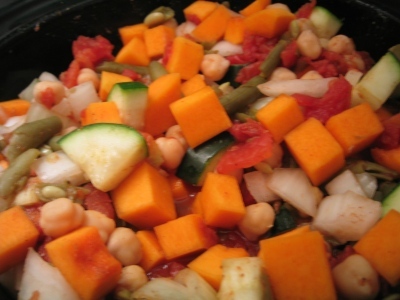 Yesterday it was Mediterranean stew with yams, tonight it’s Mediterranean stew again, substitute squash for yams (pictured above). The best will be in a few days though. I’ve never eaten a turnip before and have been dieing to try one for months now, but been at a loss as to what to do with one (is it like a giant radish, or is it more like a potato?). 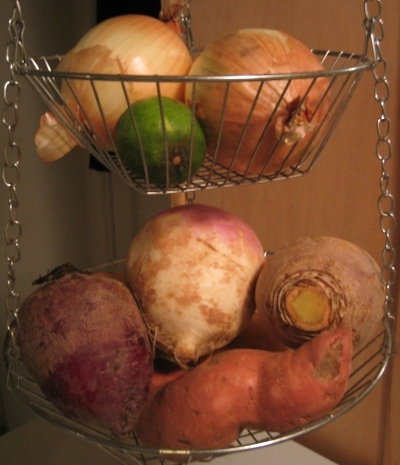 Anyway, next up on the crockpot experiment schedule is root extravaganza: turnips, rutabagas, beets, parsnips, carrots, potatoes, leeks and onions. Throw ’em in a pot and cook em’ up, yum! The model we bought even comes with a canvas tote bag so next time MoveOn hosts a meeting of the neighborhood activists or we volunteer at the retirement community we will be all ready to go. Now if only they would make a combo bag for both the crockpot and my yoga mat so that I could go strait from yoga class to whatever volunteer opportunity / activist get-together I had in store, it would be perfect. Before I leave the subject of the crockpot, a word of defense regarding structure food versus smash food is in order. Structure food is all the stuff that you see on the cooking shows: a tremendous amount of energy is given over to fussing at how all the different little pieces and individual flavors are arranged and laid out in often elaborate designs on the plate. Then there’s smash food. Smash food is where everything is just jumbled together in one admixture of flavor. The quintessential smash foods are all lowbrow. Nachos, burritos, Italian food, breakfast foods are all perfect examples. For a greasy spoon breakfast you take your egg and hash browns and run them all together and use the toast like an extra utensil to fork it all down. Even eggs Florentine is smash food masquerading as structure food. I mean, come on, the poached egg yokes and the hollandaise sauce are calling out to be all stirred around and mopped up with the English muffin.